So I've been busy busy, trying to finish school and keep up with work. It's been a hectic few weeks! I do have something to show for it though, I've created a blown sugar showpiece! 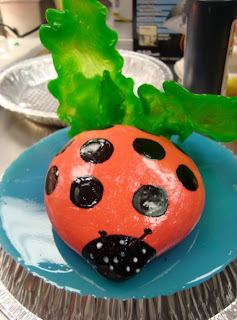 There is a blown sugar ladybug (painted on the spots) sitting with some pulled sugar leaves atop a poured sugar base. I'm pretty proud of it seeing as sugar was one of the hardest mediums I encountered during my 2 year stint at George Brown. Alas, in other news, this week was my last week of learning at George Brown, and by the end of next week I'll be finished the program! Hard to believe that I've spent the time that I did there, but I think it has all paid off! Finally, I'll be providing delicious treats at an event for Lea Ann Belter next Sunday, February 28th. The event is called "Colour Shape and Texture" by Your Shop Girl and Jessica Dexter, and it will be all about choosing the right wedding dress! Very exciting! 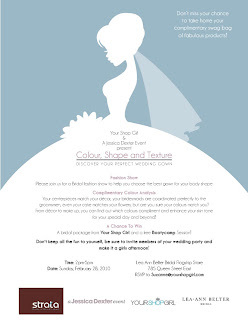 Please RSVP to Suzanne@yourshopgirl.com if you're interested in attending, it will certainly be an event to check out for brides of 2011! That's about it for now, and as promised I will be posting pictures of the demo cake that Eileen chose very soon, hopefully by this monday, so keep watching!